If you were like me, watching the Army and (although I hate to say it…) the Marine Corps commercials got you so excited that you wanted to run to the Recruiter and get on the next plane headed to Basic Combat Training! When I discovered the Civil Affairs (38A) MOS and career field, I found a different side of the Army that wasn’t talked about as much as the traditional career fields. However, it was a VERY IMPORTANT job in the Army inventory that would eventually increase in need during the Global War on Terror! During my high school years, many recruiters from all the branches came through to share the career opportunities that were available to us. Because I attended a Vocational Technical HS where all students were learning trades, I was recruited by the Navy, Air Force and Army. I was majoring in Electrical Installation and had planned on being an Electrical Engineer, so I chose the Army Reserve and selected Power Generation Equipment Repairer as my job. Joining the military offered me the opportunity to serve my country, gain valuable experience and earn college money that could help propel me towards a better future. The Army Reserve allowed me the flexibility to serve my country while continuing to work and attend college. Who would’ve ever thought that this job as a “Generator Mechanic” (as we were called) would lead me to my favorite job as a Civil Affairs Soldier! So how did I find Civil Affairs and what was so great about that particular job? I’m glad that you asked! I had served about 4-5 years as a Generator Mechanic and was in Kaiserslautern, Germany for our Overseas Deployment Training (also known back then as “Summer Camp”) and I ran into some Soldiers heading back to the U.S. from Bosnia. They were wearing the maroon berets that were worn by airborne qualified parachutists in the Army. Since I always wanted to attend Airborne School, I approached them and introduced myself. They told me that they were in fact members of an airborne unit and that they were also Army Reserve Civil Affairs Soldiers! Now keep in mind, the only thing that I really heard was “Army Reserve airborne unit” and not the Civil Affairs part! Interestingly enough, they were based out of Greensboro, North Carolina and I still lived in New York City, but I was determined to get into the unit so I could jump out of perfectly good aircraft! It took some doing, but I wound up transferring to the Civil Affairs unit about a year later! The next thing to conquer was actually travelling 10 hours from New York to attend my drill (training) weekends! 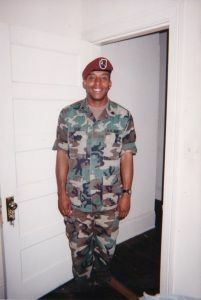 I was assigned to the 422nd Civil Affairs Battalion (Airborne) in 1996. Once assigned to the unit, I actually would drive or take the bus to my drill weekend in Greensboro, North Carolina every month! At my first drill weekend, I started learning about the mission of the unit with respect to what my job as a Civil Affairs Soldier would be, OUTSIDE of the airborne mode of transportation! Whatever the job was, I didn’t truly care as long as I could jump! So I settled in to learn about my job as a Civil Affairs Soldier. What I found was a truly unique Army job in which 98% of the personnel were assigned to the Army Reserve! Not only did I have access to fulfilling one of my Army dreams of being an Airborne Soldier, but I was now part of an important Army career field that relied on the assets of the Army Reserve! I was excited for what was yet to come! The MOS for Civil Affairs during my tenure was listed as 38A (currently 38B), Civil Affairs Specialist. It was only offered to enlisted soldiers as an actual Army course. As a Civil Affairs Soldier, I was responsible for researching, coordinating, conducting and participating in the planning and production of civil affairs related documents, while enabling the civil-military operations of the supported commander. Essentially, as Army Reserve Soldiers, our civilian capabilities and skill-sets as bankers, police officers, doctors, etc. would assist the US military in achieving its objectives by working alongside the civilian leaders in a country. Who better equipped to work on civilian-military operations than a Citizen-Soldier? I thought that this was an outstanding concept! One of the additional training schools that I had access to was language training, which was always one of my passions, and would allow me to also get paid proficiency pay to stay proficient in a second language! 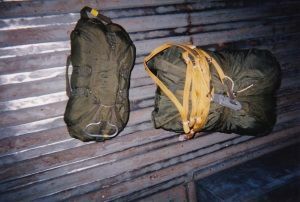 The event that solidified my love for Civil Affairs was my participation in Exercise Noble Piper, Kenya in 1998. I was assigned to a Civil Affairs team that trained over 800 soldiers from Kenya, Tanzania and Uganda. I trained the soldiers on Civil Support to Civil Administrations and Disaster Relief Operations. As a Soldier of African descent, just being able to travel to the African continent and interacting with the people there was an awesome experience! Learning the languages and eating the foods were priceless as well! The training would be put to the test when the Soldiers responded to the Embassy bombings in the home countries of the Soldiers in August of 1998! I always felt connected to the bombings because I always hoped that our training from May through July 1998 helped those countries to react quickly and in an efficient manner. I believe that this event initiated the next stage of the Global War on Terror. In an interesting twist, upon my return from Kenya, our unit was coming off of airborne status, so my Sergeant Major didn’t allow me to go to my scheduled Airborne School date in September of 1998! Despite this change, I still stayed in the unit another year because I had come to love Civil Affairs so much! Civil Affairs is my favorite job in the Army because it allowed me the opportunity to truly utilize my civilian skills in conjunction with my military duties in a large scale way. It allowed me access to be paid for what I’m passionate about: travel, assisting people both overseas and in the US, and to be a part of the Army that considers the residual effects of the civilian population AFTER the conflicts are over and done with. As it would work out, Civil Affairs operations multiplied over the last 16 years and has contributed to the overall objectives of the Army in every area of operation. If you are in the Army and are looking for a challenging change of pace from your current career, love assisting people and love the opportunity to travel, Civil Affairs is the way to go. If you are considering joining the Army or Army Reserve and have the desire to help people while utilizing your civilian skills, Civil Affairs might be the perfect fit for you. I have considered returning to Civil Affairs as an officer (the new 38A MOS) in the Army Reserve before I retire from the Army in order to reclaim a great time in my career! Thanks for sharing your time with me today! I hope that this article has added value to your life today! Till next time, take care and God Bless! Michael A. Kane is a 23 Year veteran of the Army, having served in the Army Reserve and the Army National Guard. He is a combat veteran of Iraq as well as Afghanistan. Michael enjoys being with his family, personal development, promoting strong marriages, music and entrepreneurial endeavors as a Network Marketing Professional. He has been married to his wife, Yanick for almost 16 years and they are the parents of four kids ranging in age from 12 years to 1 year old. He is currently serving as a Captain in the Virginia Army National Guard as a Platoon Trainer/Instructor at the Officer Candidate School, training the next leaders of the Army National Guard. Thanks for all the comments! Glad that my story provided you with value. Great article, my granddaughter just graduated from BC and is in Ft. Bragg for 38B AIT. She is looking forward to a deployment to Afghanistan. Article helped me understand what she is doing. A big good luck to you. Civil affairs is a very important part of the National Guard. Daily, the Guard has to intertwine with civilians, and having a strong and understanding person as a Civil Affairs officer is of utmost importance. Many civilians are suspecting of anyone in uniform. The National Guard are servants here to help and protect the whole civilian population, and it is because of people like yourself that the Guard has been trusted more and more by civilians. Thank you for your service sir. May your days always be blessed. This is a great story of coincidence combined with determination leading to a great Army career. Some things fell into place at just the right time which allowed you an opportunity to strive for a job that you ended up really enjoying. Civil Affairs sounds like an excellent path to take for service members who want to utilize their civilian and military skill sets to assist both the civilian and military communities. Thank you for this awesome article! Thank you for the comment! I believe that nothing is coincidence; everyone has a defined path in life indwelled within them by our Creator at birth. I grew up in NYC amongst many cultures, which would prepare to me working with other cultures on a truly global scale! When your purpose meets up the opportunity, your purpose comes to life! Thanks again and God Bless! !